Splash the oil into a saucepan over medium-high heat. Add the mushrooms, onions and garlic. Sauté until the mushrooms lose their moisture and the onions caramelize, about 20 minutes. This step is one of the keys to the mixture; it is important to cook out as much moisture as possible so the burger will hold together. Add the water, bulgur and soy sauce. Cover with a tight-fitting lid and cook over low heat until the bulgur is tender and has absorbed all the liquid, about 20 minutes. Pour the mixture onto a plate or tray and let it cool to room temperature. When cool, transfer the bulgur-mushroom mixture into the bowl of your food processor. Add the eggs, miso paste, breadcrumbs, black beans, thyme and salt and pepper. Purée until smooth. Form the mixture into evenly shaped patties about 1 inch (2.5 cm) thick. Refrigerate until firm, about 1 hour. Preheat your barbecue on its highest setting. 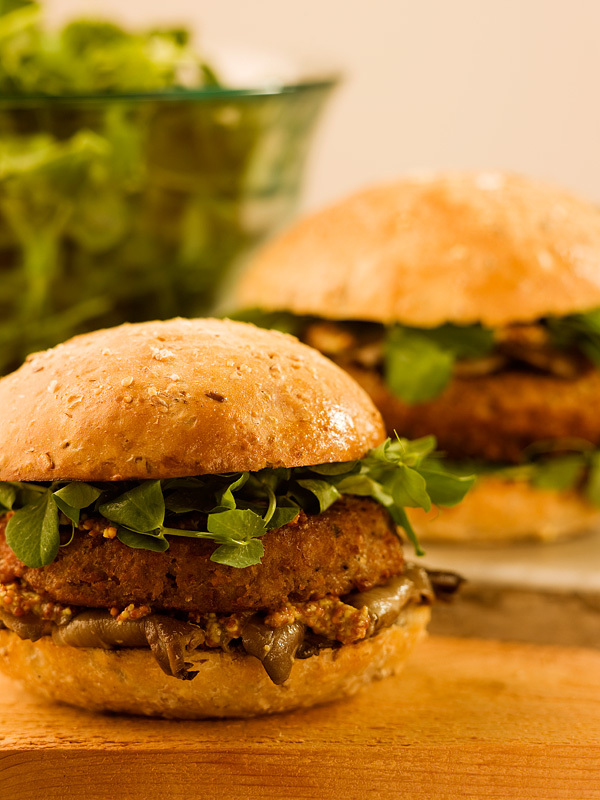 Lightly brush the burgers with oil and grill until they are cooked through and caramelized a bit. Alternatively, you may pan sear them in a lightly oiled preheated pan or simply bake them at 400 °F (200 °C). Enjoy with your favourite burger toppings. Try substituting a spoonful or two of chili powder for the fresh thyme. This is one of my favourite side dishes because bacon and lentils are perfect together. The rich meatiness of bacon easily complements the earthy hearty flavours of lentils. Try making this dish once and it will instantly become one of your favourites too! This salad perfectly combines the flavours of the land and sea! 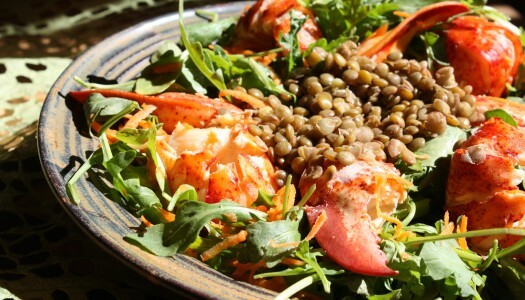 The earthy heartiness of the lentils anchors the dish, the brininess of lobster adds lots of luxurious sweetness and the sharp, peppery arugula ties everything together.